Featuring handmade bent opalescent amber white glass panels set in a brass perle motif frame on an antique finish lamp base. For an individual light to suit your décor other colours are also available in this range. For further information about the alternatives, please contact us. Made in Great Britain and part of the Topkapi handmade lighting range. 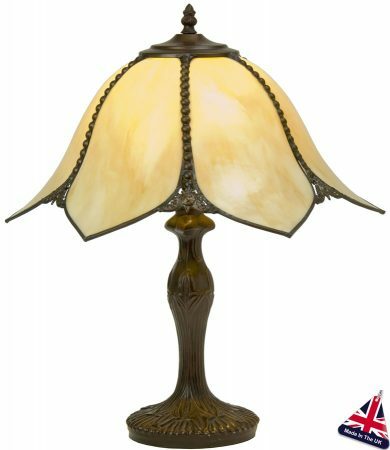 A wonderful Art Nouveau themed table lamp. Hi, I’m interested in a number of the topkapi lights. Can you confirm the size of the table lamp as the sizing appears rather large for a table lamp. Are this available in smaller diameters? Thanks. Hello Danie, the Topkapi table lamp is 370mm in diameter and 500mm high. It is handmade in England and takes 2 – 4 weeks to be delivered, thank you.